Liam O'Flaherty story: The Sniper. "What's up?" Rosh asked, as he entered his son's room. "Just finished writing my school assignment," said Josh. 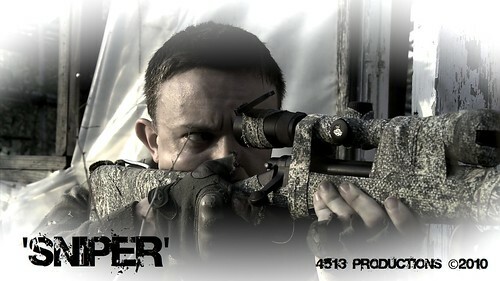 "My thoughts on 'The Sniper', a story written by the Irish writer Liam O'Flaherty. Have you read it? Touching story." "Is it?" asked Rosh. "No, I haven't read it. I certainly don't remember it, even if I may have. What's it about?" "It's just too good to paraphrase," said Josh. "I can read it to you, and then perhaps we could discuss it, if you have the time." Rosh settled comfortably in his son's bed. He was in the mood for touching stories today, and no matter what, he always made time for his son. The long June twilight faded into night. Dublin lay enveloped in darkness but for the dim light of the moon that shone through fleecy clouds, casting a pale light as of approaching dawn over the streets and the dark waters of the Liffey. Around the beleaguered Four Courts the heavy guns roared. Here and there through the city, machine guns and rifles broke the silence of the night, spasmodically, like dogs barking on lone farms. Republicans and Free Staters were waging civil war. On a rooftop near O'Connell Bridge, a Republican sniper lay watching. Beside him lay his rifle and over his shoulders was slung a pair of field glasses. His face was the face of a student, thin and ascetic, but his eyes had the cold gleam of the fanatic. They were deep and thoughtful, the eyes of a man who is used to looking at death. He rolled over the roof to a chimney stack in the rear, and slowly drew himself up behind it, until his eyes were level with the top of the parapet. There was nothing to be seen--just the dim outline of the opposite housetop against the blue sky. His enemy was under cover. The turret opened. A man's head and shoulders appeared, looking toward the sniper. The sniper raised his rifle and fired. The head fell heavily on the turret wall. The woman darted toward the side street. The sniper fired again. The woman whirled round and fell with a shriek into the gutter. Suddenly from the opposite roof a shot rang out and the sniper dropped his rifle with a curse. The rifle clattered to the roof. The sniper thought the noise would wake the dead. He stooped to pick the rifle up. He couldn't lift it. His forearm was dead. "I'm hit," he muttered. Dropping flat onto the roof, he crawled back to the parapet. With his left hand he felt the injured right forearm. The blood was oozing through the sleeve of his coat. There was no pain--just a deadened sensation, as if the arm had been cut off. In the street beneath all was still. The armored car had retired speedily over the bridge, with the machine gunner's head hanging lifeless over the turret. The woman's corpse lay still in the gutter. The sniper lay still for a long time nursing his wounded arm and planning escape. Morning must not find him wounded on the roof. The enemy on the opposite roof covered his escape. He must kill that enemy and he could not use his rifle. He had only a revolver to do it. Then he thought of a plan. Taking off his cap, he placed it over the muzzle of his rifle. Then he pushed the rifle slowly upward over the parapet, until the cap was visible from the opposite side of the street. Almost immediately there was a report, and a bullet pierced the center of the cap. The sniper slanted the rifle forward. The cap clipped down into the street. Then catching the rifle in the middle, the sniper dropped his left hand over the roof and let it hang, lifelessly. After a few moments he let the rifle drop to the street. Then he sank to the roof, dragging his hand with him. The Republican sniper smiled and lifted his revolver above the edge of the parapet. The distance was about fifty yards--a hard shot in the dim light, and his right arm was paining him like a thousand devils. He took a steady aim. His hand trembled with eagerness. Pressing his lips together, he took a deep breath through his nostrils and fired. He was almost deafened with the report and his arm shook with the recoil. Then when the smoke cleared, he peered across and uttered a cry of joy. His enemy had been hit. He was reeling over the parapet in his death agony. He struggled to keep his feet, but he was slowly falling forward as if in a dream. The rifle fell from his grasp, hit the parapet, fell over, bounded off the pole of a barber's shop beneath and then clattered on the pavement. The sniper looked at his enemy falling and he shuddered. The lust of battle died in him. He became bitten by remorse. The sweat stood out in beads on his forehead. Weakened by his wound and the long summer day of fasting and watching on the roof, he revolted from the sight of the shattered mass of his dead enemy. His teeth chattered, he began to gibber to himself, cursing the war, cursing himself, cursing everybody. He looked at the smoking revolver in his hand, and with an oath he hurled it to the roof at his feet. The revolver went off with a concussion and the bullet whizzed past the sniper's head. He was frightened back to his senses by the shock. His nerves steadied. The cloud of fear scattered from his mind and he laughed. "Yea," interrupted Rosh. "Snipering can't be good for the nerves. The planning. The waiting. In the middle of a war. Not knowing where the next bullet will be coming from. Especially so, when you know your enemy is also a sniper. Dangerous, armed, and out to get you!" "I remember the stress and nerves the Spanish actor Antonio Banderas showed in his memorable performance in the movie Assassins, while he sat at the window of a dilapidated building, as sniper Miguel Bain, waiting to kill a rival sniper in the street below him." Taking the whiskey flask from his pocket, he emptied it a drought. He felt reckless under the influence of the spirit. He decided to leave the roof now and look for his company commander, to report. Everywhere around was quiet. There was not much danger in going through the streets. He picked up his revolver and put it in his pocket. Then he crawled down through the skylight to the house underneath. When the sniper reached the laneway on the street level, he felt a sudden curiosity as to the identity of the enemy sniper whom he had killed. He decided that he was a good shot, whoever he was. He wondered did he know him. Perhaps he had been in his own company before the split in the army. He decided to risk going over to have a look at him. He peered around the corner into O'Connell Street. In the upper part of the street there was heavy firing, but around here all was quiet." Then the sniper turned over the dead body and looked into his brother's face. Note: The Sniper by Liam O'Flaherty is in public domain.